I didn't think I had anything for Sepia Saturday today. Then I remembered my great uncle's post card scrapbooks. They were full of Easter cards. Most of them not too interesting. This one is slightly funny. It says "A Happy Eastertide". It should have a P.S. " I hope you don't find a bug in your Easter egg!" Did you know hedgehogs grew on trees? We saw these on our noon- day walk. When my sister, Nancy, saw the Sepia Saturday photo and theme this week -Camels, politicians, etc...(President Roosevelt riding a camel) she said "you've got the perfect camel photo". You would assume that this photo of me might have been taken at a "photo op" in Egypt. 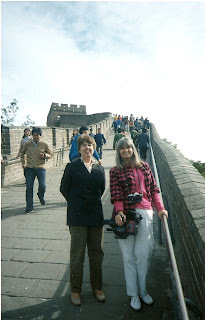 But if you look closely you can see The Great Wall in the background. 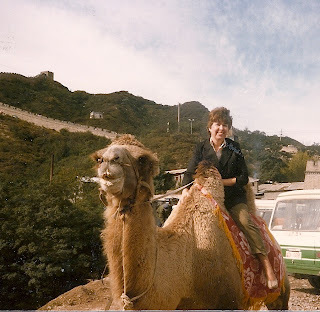 I didn't know they had camels in China. I suppose they do in the dessert but that's not where this was. This was not too far from Beijing. 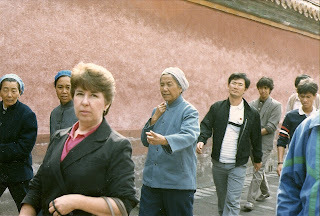 These were taken in about 1985 (before The Tianamen Protests of 1989). We were there on a business trip. A sort of strange business trip. Our business at the time was needlework kits and books. Making things with doilies was popular at the time. We had several kits and books on the subject. So we imported doilies through an importer in San Francisco. He was the main (and at the time, only) importer of doilies from China. He was called "The Doily King". He took us with him on one of his buying trips. It wasn't a fun trip but it sure was interesting. There weren't many foreigners in China at the time, so we often attracted attention. Here's Nancy and I strolling on The Great Wall. It was actually quite steep, at least at this point and not at all good for strolling. More like climbing, and very exhausting. To see more Sepia Saturday click here. I put this on Sepia Saturday by mistake. #28 on Mr. Linky is the right one. 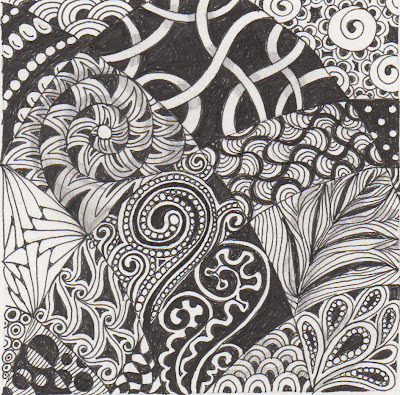 I'll bet you Sepia Saturday people are wondering "What the heck is a Zentangle. Well now you have a slight idea. If you're interested, leave a comment and I'll tell you more about it. 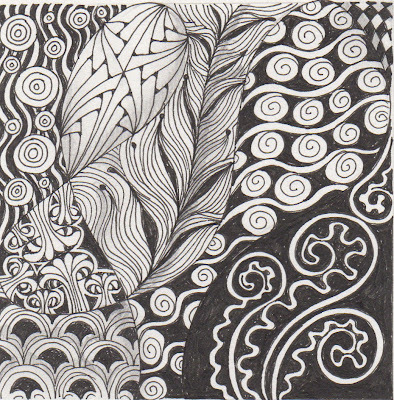 And you Zentangle folks are probably wondering what Sepia Saturday is. 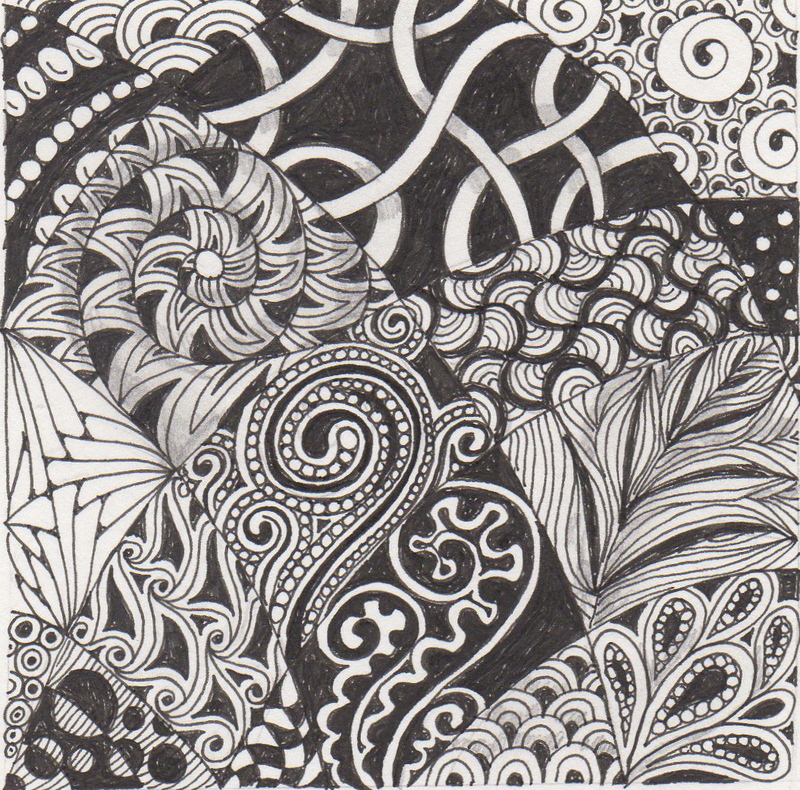 Maria Thomas (who, along with her husband, Rick, developed Zentangles) designed and named this "tangle" after Alphonse Mucha (1860-1939) the great Art Nouveau artist. 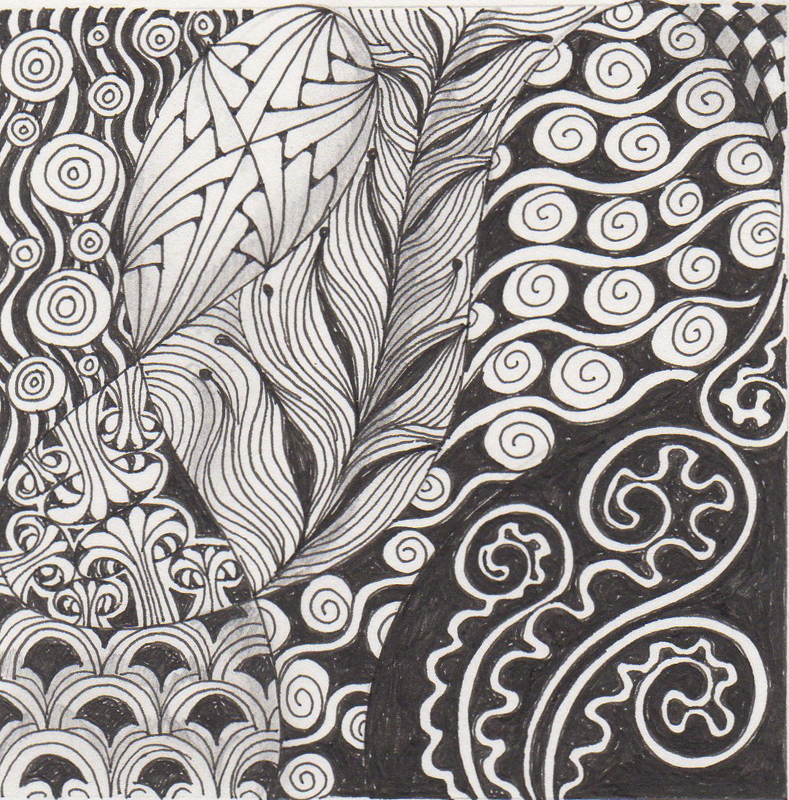 You can read more about it here and see how to do it (The official Zentagle Newsletter- Mooka). He's one of my favorite artists. When you think Art Nouveau you think Mucha. The face is a (slightly doctored) rubber stamp. There's just a little bit of "Mooka" on the butterfly's antenna. Connie in front of her pretty house in La Jolla. She served us a wonderful lunch, starting with hors d'oeuvres. Three different salads and homemade pumpkin rolls. Nancy and Jean dig in. We then took a walk along the shore watching the pelicans fly by. We walked through the beautiful neighborhood full of charming houses. It's a very dog-friendly neighborhood. A painter captures the ocean... and poses for my camera. The colors of his shirt exactly match his painting. We tried to walk down to the beach but the recent big waves (from the Japanese tsunami) had washed away so much sand that the last step was way too steep. It was a wonderful day full of good food, good conversation and a great walk along the shore and through the beautiful neighborhood. Connie is such a good hostess.